Last week I made another trip to Guadalupe Island (Isla Guadalupe) on my favorite boat, M/V Horizon, captained by Greg Grivetto. The trip was conducted in collaboration with Patric Douglas and SharkDiver.com. Of all the boats and captains working at Guadalupe Island, the Horizon and Captain Greg have to have the greatest experience at Isla Guadalupe. The Horizon and the Grivetto family have been hosting open-water diving (non-cage) trips to the island since 1994. And since 2001, when he captained the first of the modern Guadalupe island cage diving trips that have since lent the island the fame that it now enjoys as the world’s finest white shark viewing location, Captain Greg has led shark diving expeditions to Guadalupe Island each year, from August through October. I have had the good fortune to join him at Guadalupe at least 15 times now (frankly I’ve lost track as I don’t actually have a dive log anymore) with somewhere in the neighborhood of 110 days spent either tank diving, free diving or in a cage looking at sharks. I like being at the island. This year we motored down to Guadalupe Island under remarkably uninspiring conditions. The seas were calm and the ride comfortable, but we saw virtually no blue skies once we got south of the Coronado Islands. 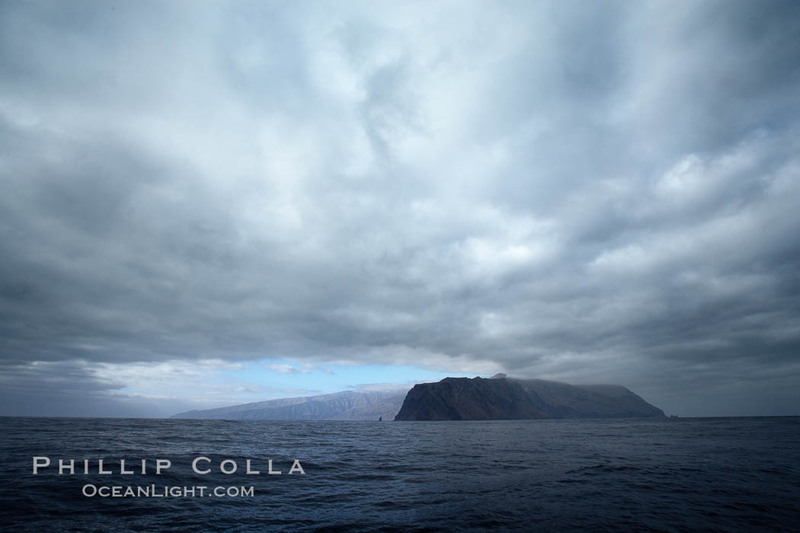 As we made our approach to the north end of Guadalupe Island the clouds were quite heavy and dark. However, the towering cliffs that make up the north end typically reach into the clouds and hold open a donut-hole of blue sky. Sure enough, as we reached the island, the skies parted and we had glass water and warm sun as we anchored the boat and prepared to get in the cages. Guadalupe Island, dark and gloomy clouds, northern approach. Shark Diving resources: Horizon Charters and SharkDiver.com. Be sure to check out our hundreds of additional Guadalupe Island photos.